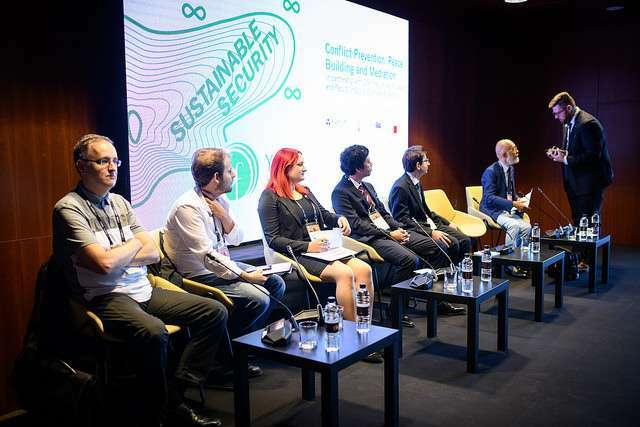 The first of the two Young BSF panels that were incorporated into the main forum in Bled this year tried to find ways to prevent conflicts, build peace and use mediation, by focusing on contemporary cases in the Balkans and the Middle East – from the political, cultural and social aspects. Faris Kočan, research assistant at the Ljubljana Faculty of Social Sciences, presented an ongoing project, entitled Strengthening European Integration through the Analysis of Conflicting Discourses: Revisiting the Past, Anticipating the Future. The interdisciplinary project, which involves several universities, will include a cross-cultural analysis of the conflict discourses in Cyprus, Ireland, Greece, Bosnia, Kosovo, Spain, Germany, and Poland, looking at histories, media, arts and culture, and political narratives as the key elements allowing a better understanding of the specific situations. Asked by an audience member about the view that forgetting the past is sometimes similarly important as remembering it, Kočan said that in the case in Bosnia, for instance, it cannot be expected that the past will be forgotten, with three different narratives currently present. “It is important to get a common narrative, so once you have it, you life together. You will never forget about a conflict in my opinion,” he said. Miro Haček, social sciences professor at the Ljubljana Faculty of Social Sciences, presented a study that highlights democratic consolidation as a key aspect of peacekeeping in the Western Balkans. The study analysed the consolidation trends in former Yugoslav republic, for instance via the Human Development Index and through Freedom House’s Democracy index. Both show Slovenia and Croatia standing out, in particular the former as the only one deemed a consolidated democracy in 2016. Bosnia, Kosovo and Macedonia are currently not considered democratic. Haček is particularly concerned by the negative trend seen in recent years, not only in the former Yugoslavia but across Central and Eastern Europe. Maja Dolinar, a double PhD candidate in international relations and social and cultural anthropology at the University of Ljubljana, looked at developments in EU-Mediterranean relations. She argued that the EU had approached the region under three basic assumptions that proved misguided. The first was the idea it would be able to engage in region building, ignoring that the region has never been homogeneous. It moreover primarily saw it as its southern neighbourhood, neglecting the influence of other international players that are also present and have become more present after 2011, actually treating the region as a battlefield that has seen rough competition for power and influence. The third assumption was the EU has a high level unity in policy formation and implementation. The EU’s foreign policy however remains highly intergovernmental and consensus and coherent action as regards the Southern Mediterranean has been elusive. “In the case of the Arab uprising it even become obvious that in several cases the EU members were pursuing national interests which were often at odds with the official position of the EU,” she said, highlighting the military intervention in Libya and the handling of migration flow as examples. The incoherence of the EU’s policies and their implementation has undermined the bloc’s credibility in the region. In its recent declarations the EU has acknowledged the problem and its trying to act with more flexibility and sensitivity towards its partners, which is proving more effective. Mostafa Khalili, an Irani student at Doshisha University who is researching interethnic relations in Iran with a focus on Iranian Azeris and Kurds, spoke about how Iran is much more fragmented than it seems from the outside – only about 50% of Iranians are Persian. Khalili, who fears “balkanisation”, meaning confrontations, in the area, also noted the many divisions among the Kurds. He sees a more sociological, anthropological approach as very useful for getting to understand how ethnicity is being constructed and deconstructed in the region, including by political players. “We really need to understand the situation first and only then try to put forward some proposals. This for instance did not happen in Afghanistan, Syria and Iraq – they just started with big policy moves without establishing the social problems,” he illustrated. Akihiro Ienaka, a graduate student at Doshisha University who has researched politics in modern Turkey and memory studies, provided an analysis of Turkey’s evolution from Kemalism to Erdogan. One thing he highlighted as an issue was the sidetracking of talks on EU membership, which he believes is also a result of the Erdogan government’s alledged focus on staying in power as its main objective.